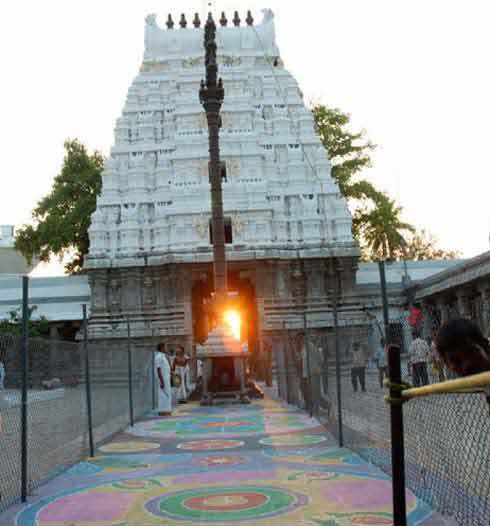 Every year on 25th, 26th and 27th of March, the sun's rays fall on the main murti worshipped at the Sri Veda Narayanaswami Temple at Nagalapuram near Tirupati between 1800 hrs and 1815 hrs. On the first day, the rays fall on the feet, on the second - on the chest and on the third on the forehead. 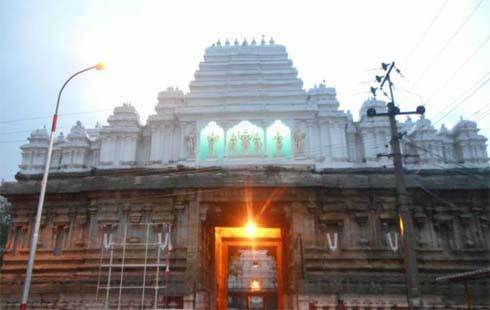 The temple is located on the Chennai – Tirupati Highway and is around 81 km from Chennai and 70 km from Tirupati. The shrine is dedicated to the Matsya Avatar Murti of Vishnu. Legend has it that Surya, sun god, pays his respects to Lord Vishnu by shedding his rays on Him and warming Vedanarayana Swami who had to fight a long battle with Somakasura in the cold waters of the ocean to retrieve the Vedas. This holy event has been happening in spite of the fact that the distance between first prakaram and the sanctum sanctorum is more than 600 yards and has many structures in between. It is yet another example of the architectural wonder of ancient Hindu world. The darshan of the lord at the time of shower of the sun rays is believed to be most auspicious. Special festivities mark the three day when the divine rays of the Sun touch the presiding deity. Following the vykhanasa agama tradition, apart from the regular sevas, snapanatirumanjanam for the utsavamurthis is performed in the late afternoons followed by special offering of naivedyams for the Lord. The divine event of falling of the sun rays on Vedanarayana Swami is followed by punyahavachanam in which the temple and its surroundings are consecrated with holy waters. The utsava murti of Vedanarayana Swami then goes around the streets in a procession along with his consorts to provide darshan to those who couldn’t come to the temple. This procession culminates in the Float Festival where the utsavamurthis float around the Vedapushkarani, the sacred tank of the temple showering their benign blessings on everyone. Special pujas are repeated on all three days.